SAINT JOHN, N.B. — Tanner Latsch (Twin Lakes, Minn.) and Blake Biondi (Hermantown, Minn.) each tallied a pair of points, but the U.S. National Under-17 Team fell to Canada Black by a 5-4 final Tuesday to conclude preliminary-round play at the World Under-17 Hockey Challenge at Harbour Station in Saint John, New Brunswick. Team USA holds a 1-0-2-0 (W-OTW-L-OTL) record in the tournament and will play in a quarterfinal matchup Thursday (Nov. 8) against Canada Red at 7:30 p.m. local/6:30 p.m. ET. "It was a great start to the game for us, but we showed some immaturity in big moments throughout the second and third period," Seth Appert, head coach of the U.S. National Under-17 Team, said. "We will learn from this, regroup tomorrow and be ready for a hard quarterfinal game." Latsch scored the game’s opening goal when he corralled a rebound at the edge of the crease and slid it into the back of the net 38 seconds into the first period. Latsch later added his second point of the game after he collected an assist on Biondi's first-period goal. Team USA outshot Canada Black by a 16-5 margin in the opening frame. However, Canada Black responded with four goals in the second period. Ozzy Wiesblatt tied the game at the 7:29 mark before Quinton Byfield put Canada Black in front 1 minute, 8 seconds later. 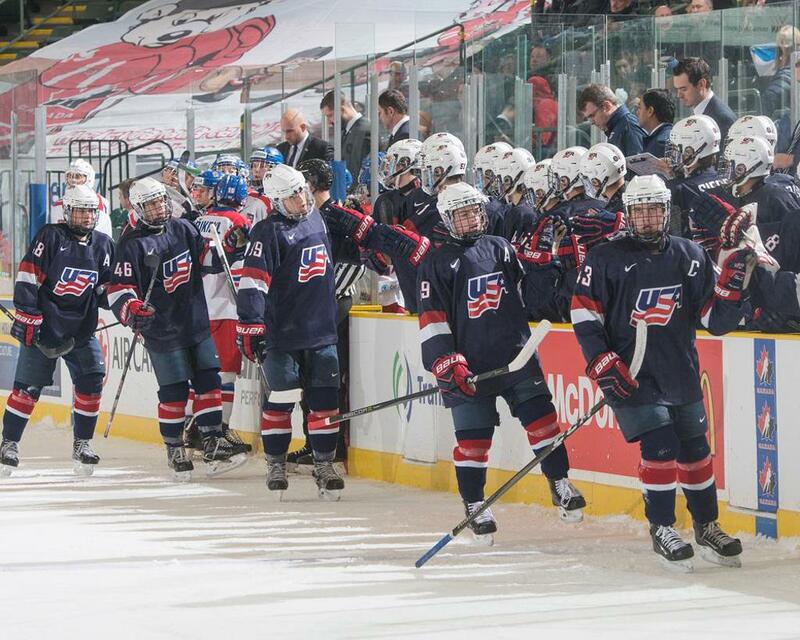 The U17s showed resiliency in the final period and erased a two-goal deficit. Landon Slaggert (South Bend, Ind) brought Team USA within one goal when he finished a feed in tight from Biondi. Eamon Powell (Marcellus, N.Y.) scored the game-tying goal on the power play when his wrist shot from the point beat Canada Black goaltender Joe Vrbetic with 2:15 to play in regulation. However, Canada Black regained a late lead just 44 seconds later and staved off Team USA's empty-net attack to preserve the win. Team USA goaltender Drew Commesso (Norwell, Mass.) stopped 19 of 24 shots. 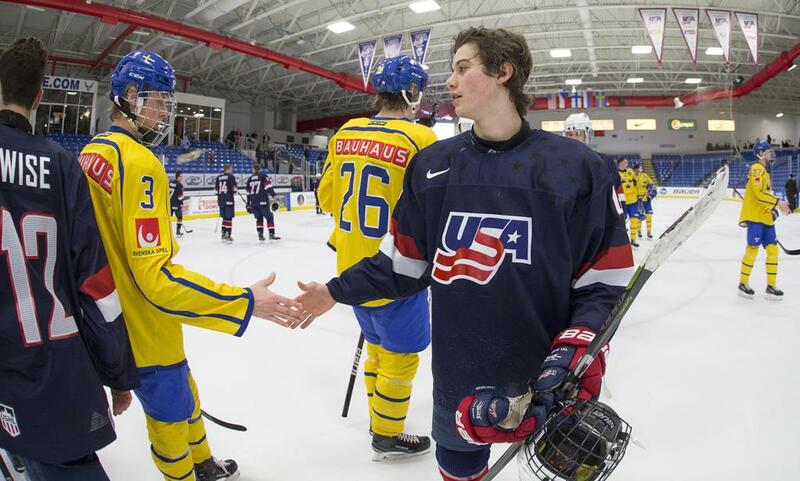 NOTES: Brock Faber (Maple Grove, Minn.) earned the Player of the Game honor for Team USA ... Team USA outshot Canada Black by a 31-22 margin ... Team USA went 1-for-4 on the power play and 4-for-4 on the penalty kill ... All preliminary-round games, as well as quarterfinals and placement games, will be available via live stream on HockeyCanada.ca/WU17 … TSN will broadcast both semifinals, as well as the bronze- and gold-medal games in Canada … the official tournament website found here … The Team USA homepage for the 2018 World Under-17 Hockey Challenge can be found here … The 2018 World Under-17 Hockey Challenge includes two groups of four teams. Group A features Canada Black, Canada White, the Czech Republic, and the United States, while Group B includes Canada Red, Finland, Russia, and Sweden ... Follow @USAHockeyNTDP on Twitter for tournament updates and join the conversation on social media by using #WorldU17 … Seth Appert (Cottage Grove, Minn.) will lead the U.S. National Under-17 Team along with associate coach Nick Fohr (Grand Forks, N.D.), intern assistant coach Jared Nightingale (Jackson, Mich.) and goaltending coach Thomas Speer (Janesville, Wis.).